PORT CHARLOTTE, Fla. — The board overseeing a condominium building in Florida has adopted a resolution that prohibits religious gatherings from being held in the commons areas. 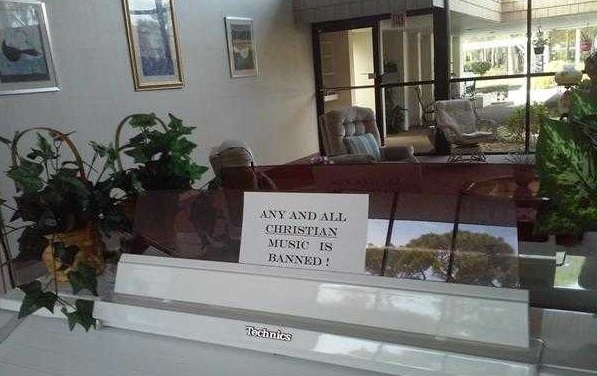 A sign has now also been placed on a piano prohibiting residents from playing Christian music. One resident, a Seventh Day Adventist lay minister, was issued a letter that informed her that she could no longer hold Bible studies in the social room, one of the commons areas. “At the board of directors meeting on February 16, 2018, the attached resolution was adopted. The result of this resolution prohibits Bible study meetings in the social room effective [immediately],” the letter read. Now, the religious liberties organization First Liberty has filed a complaint with the Department of Housing and Urban Development (HUD) and is asking for Secretary Ben Carson to rectify the matter. “The board’s failure to include the Cambridge House resolution in the posted meeting agenda or otherwise notify the condominium owners of the proposed resolution constitutes a violation of [Florida law],” the complaint states. It also asserts that the board’s actions violate federal housing laws because it singles out religion for exclusion. “The Cambridge House resolution, both in text and in application, is discriminatory and violates the Fair Housing Act because it prohibits … Christian residents from accessing common condominium areas for any religious activity, while allowing other residents to use those same facilities for similar secular purposes,” the letter outlines. “The resolution poses no obstacle to a group meeting in the social room to study a secular book, watch a secular movie, listen to secular music, or carry on an organized secular discussion, but it prohibits … condominium residents from meeting in the social room to study a religious book, watch a religious program, listen to religious music, or even participate in a conversation about their religious faith,” it explains. First Liberty has requested an investigation into the matter. Game and movie nights are reportedly still being allowed in the commons areas, but not religious activity. Read the complaint, as well as the adopted resolution, here in full. Gateway Group, which owns Cambridge House, has declined to comment on the matter.